I arrived mid-June for summer training for Army cadets at the Cadet Leader Course (CLC) at Fort Knox, Kentucky, that would last until the second week in August. Like the Army does, I was “volun-told” to be a Military Science III (MSIII) squad leader at Cadet Initial Entry Training (CIET) for the underclassmen before reporting for my own CLC dates. I was mad, to say the least, because my entire summer was shot. Looking back, though, I thank God I was at Fort Knox for those roughly fifty days because that’s what it took to get me to realize something in my life had to change. Having grown up with a mother who was an alcoholic and drug addict, I started making my own poor decisions in college. I dated a married man for several months, was victimized by a con-artist, and had done and seen other things I am not proud of. But somehow I hadn’t completely lost my faith in God. In the first week at CLC, I decided to go to the Wednesday evening Protestant church service. While in the chapel I heard an announcement about a Bible study immediately following the service. That I stayed for it was a huge step for me because at that point I had never experienced a Christian community outside of church pews. Although I didn’t have a deep relationship with Jesus I still considered myself a believer. My faith modeled that of the average American “Christian” who goes to church Easter/Christmas/whenever convenient, prays before a meal, and talks to God when depressed or in need—only to turn around and blame Him for personal shortcomings. But it wasn’t until that first Bible study that I began to take my spiritual life seriously, faced with very real questions: where are you in your spiritual maturity? Do you simply know facts about Jesus or do you know Him personally? Do you even know what that looks and feels like? BOOM. It hit me hard. I had no idea what true joy and peace felt like because I was leading a self-centered life, concerned with my own happiness. 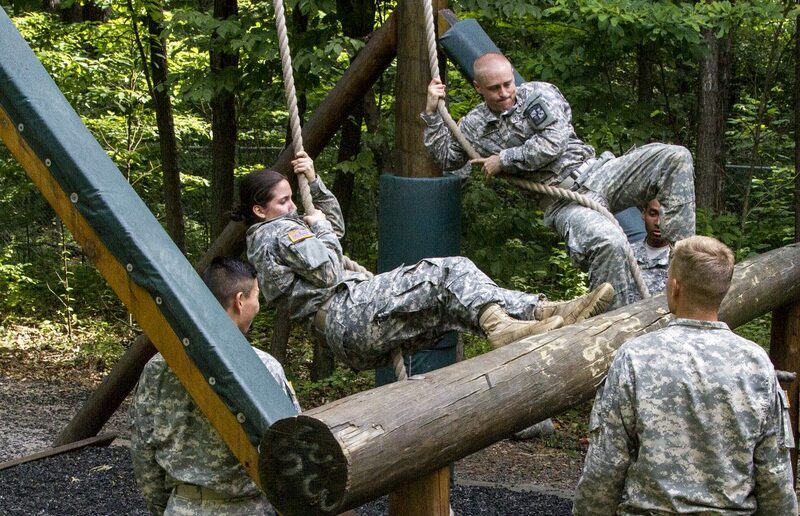 Cadet Initial Entry Training (CIET) candidates tackle the challenge of an obstacle on the confidence course during Cadet Summer Training at Fort Knox, Kentucky. Those questions just killed me. I started tearing up when a girl next to me spoke out, saying she wasn’t the woman she wanted to be. Right there in that moment, Lola Deckard, who was leading our study, prayed with this cadet to rededicate her life to Christ and give Him control. “Me too,” I blurted out. “I want that too!” And our group prayed. From that point on, and all throughout my Fort Knox summer, I kept having “God moments.” He would reveal himself to me all the time, especially in the field. When I was tired, fatigued or simply aggravated by that “one guy” in the platoon, I would cry out in prayer. I read the Bible and other Christian literature daily. I was given the Rick Warren Purpose Driven Life forty-day devotional from a chaplain when I had forty days left at camp (do the math on that God-thing! )—that book lived in my ACU pants pocket and went everywhere with me. Jesus’ power to save shouldn’t be kept secret, so after summer training at Fort Knox and back at the University of Missouri-Columbia, I started a Valor Bible study. As the weeks and months passed, we grew in number and ended our year with nearly fifteen committed cadets. I felt so honored, with the Holy Spirit’s aid, to minister to these young hearts and minds hungry for Jesus. I sometimes wonder why I am in the Army, why I chose this path—if I am meant to be in this profession. That’s when God quickly reminds me He’s placed me here in this Army environment on purpose—and He has a plan. I enjoy conversing with other Army officers, soldiers, and those I come in contact with in the civilian world, so I started a Sunday evening small group on post at Fort Huachuca, Arizona, for my fellow classmates. I feel that the Lord has called me to share my story because I know what life looks like without Him in it—and it’s one not worthy of living. Although not every day is sunshine and rainbows—the Bible doesn’t promise us a life of ease without suffering—with Him in my life, I am content and have joy beyond measure. It’s the promise of a beautiful future with God—in eternity where there will be no more death—that keeps me motivated to serve our country while serving Him. My 2015 experience in Kentucky brought me to the foot of the cross, saving my soul in a way words cannot explain. What Jesus did on the cross is remarkable. He died for you, for me—so ugly and imperfect in our sins. Yet, no matter how far we stray from Him, Jesus loves us. He’s only a prayer away. I love sharing Jesus because my story shows how powerful and sovereign the Lord truly is. Taylor, who aspires to serve in law enforcement in the military and civilian capacities, is attending the Military Intelligence Basic Officer Leader Course (MIBOLC) at Fort Huachuca, Arizona. After her April graduation, she transitions to Fort Hood, Texas, for training, and then on her first deployment this summer with her Missouri National Guard unit.